With spring just about peeking its head around the corner, the Merrickville Book Emporium is looking forward to another busy summer season in beautiful Merrickville, Ontario. While we did stay open over the winter, we used the off-season to expand and reorganize our store as well as to build up our eclectic collection of quality used literature. We are particularly pleased to have acquired a sizeable collection of texts published by The Hakluyt Society. Since 1846, the London-based Hakluyt Society has published scholarly editions of primary records of historic voyages, travelogues, and other important geographic works. Our collection spans from the 1940s to the 2010s (with one or two unfortunate gaps) and includes a myriad of fascinating texts from the ancient Periplus of the Erythraean Sea (an important navigational text presenting detailed information on the ancient ports of the Red Sea and Indian Ocean) to late nineteenth century journeys of discovery in Africa and much, much more in between. Aside from presenting all sorts fascinating information (the account of early nineteenth century British exploration of the Niger River is a personal favourite! ), the books themselves are beautiful with their uniform design of bright blue boards and gilt ship decoration. Moreover, the collection had been kept very well -- a number of the earlier books from the 1940s were unread as evidenced by the fact that many of the pages remained opened (that is, the leaves are uncut). Clearly, these books are waiting for the right reader to come along and open them up! Christmas in Merrickville with Carol Williams and Emma Field! With the holidays upon us, the entire town of Merrickville will be celebrating Christmas in Merrickville this Saturday, December 6th. The town will be chock-full of cheer with wagon rides, a petting zoo, carolers, and even a morning visit from the St. Nick himself! As part of our Christmas in Merrickville celebrations, the Merrickville Book Emporium will be hosting acclaimed local writer Carol Williams, author of the popular Emma Field series of novels. Read and re-read by young people and adults alike, the Emma Field series is about a young girl who grows up amongst the Quakers of her pioneer community of Bloomfield, Canada. Her further adventures take her amongst the Quakers of Nine Partners, New York, and later the runaway slaves and Haudenosaunee Iroquois of the Great Lakes. Readers of the Emma Field series often praise author Carol Williams for the details she includes in her descriptions. But the descriptions are easy for her to come by. The farm where Emma started life has been in the Williams family for 200 years. The lambs which Emma helped birth could be lambs born on Williams’s farm south of Merrickville. The challenges Emma faced in school dove-tail with those faced by Williams as she teaches in the local high schools. The Quaker presence which surrounded Emma is a presence which has deeply enriched Williams’s life and every single description of the natural world around Emma have come from Williams opening her senses to the sights, sounds and smells of life around her. Come out and find the story behind the stories at 1:00 as Carol Williams shares photographs, family tales and cookies baked from a 19th Century Quaker cookbook. Boxed sets, created by Merrickville’s Larry Thompson of Greyweathers Press will be available for sale. Williams’ writing has been described as the combination of earth, edge and steadiness. If you like the writing of Lucy Maud Montgomery (Anne of Green Gables), Gabrielle Roy (Children of My Heart) and Paulo Coelho (The Alchemist), you will enjoy these books. Store Appearance by Acclaimed Local Author! Join us this Saturday when local novelist Perry Prete will be at the Merrickville Book Emporium signing copies of his books, All Good Things and The More Things Change. A winner of the Pinnacle Book Achievement Award, Prete writes suspenseful thrillers set in the Ottawa Valley. For more information on Perry and his works or to order copies online, please visit sandspress.com. Join us this Sunday, November 16th, between 1 and 4 pm when author Gerasimos Kambites will be at the Merrickville Book Emporium signing copies of his recent book, Tears On The Equator, a powerful autobiographical tale of spiritual struggle on an equatorial African island. Born in Montréal in 1947, the third generation Greek-Canadian has written articles for National Geographic, produced an audio documentary on the Orthodox monastery at Mount Athos, and served as the videographer for the Transworld Snowmobile Expedition. After studying divinity and medicine, Gerasimos traveled to Uganda in the 1970s where he founded the Annunciation Orthodox Church on Bukasa Island in Lake Victoria. Tears On The Equator is the story of his experiences raising a church and a family in Uganda against the backdrop of political oppression, warfare, and the AIDS epidemic. Since retired from the priesthood, Gerasimos works as an Orthodox psychotherapist and raises sheep and horses with his wife on their farm in Eastern Ontario's Rideau Valley. The Merrickville Book Emporium is proud to host Ottawa based author, Esther Paul, next Sunday, October 12th from Noon to 3:00 PM. Esther will be reading from and signing her latest book, "Mending Fences", an entertaining collection of short stories -- four of which are award-winning. Many of the stories are about resolving regrets from the past. Esther is also the author of "A Railway Kid" -- a collection of autobiographical stories about growing up on the Canadian Prairies during the Great Depression -- as well as "In Spite Of All That" -- the story of a twentieth-century woman's journey through adult life to late middle age. Both of these books will also be available. Meet Dan Black, author of "Old Enough To Fight"
Local author Dan Black will be at the Merrickville Book Emporium this Saturday, January 18th, from 11 am to 2 pm signing copies of his recent book, Old Enough To Fight. Old Enough To Fight presents the untold story of the underage soldiers who fought for Canada in the Great War. Over 15,000 underage boys signed up for Canada’s armed forces. Boys as young as ten fought alongside their elders in all the major battles of the First World War. Many were injured or suffered psychological wounds. Many died. This is the first book to tell their story. Some boys joined up to escape unhappy homes and workplaces. Others went with their parents' blessing, carrying letters from fathers and mothers asking the recruiters to take their eager sons. Authors Dan Black and John Boileau, who narrate the fighting with both military professionalism and humanity, portray many boys who, in the heat of battle, made a seamless transition from follower to leader to hero. The authors combed the archives and collections to bring these stories to life. Meticulously researched and abundantly illustrated with photographs, paintings, and a collection of specially commissioned maps, Old Enough to Fight is Canadian military and social history at its most fascinating. The Merrickville Book Emporium is proud to host Diana Beresford-Kroeger on Saturday, December 14th from 1pm to 4pm, when she will be signing copies of her new book, The Sweetness of a Simple Life. One of the world’s preeminent scientists mixes wisdom, wonderment, and plenty of common sense in a back-to-basics guide for living simply and well. Orphaned at an early age, Diana Beresford-Kroeger was tutored by elderly relatives in Ireland in the Druidic tradition. She was taught the overlap between the arts and sciences, and the triad of body, mind and spirit—early teachings that formed the foundation for her unique approach to science and daily life. After pursuing a PhD. in medical biochemistry, Beresford-Kroeger set out on a personal quest to preserve the world’s forests for the sake of the natural world and ourselves. The Sweetness of a Simple Life calls on Beresford-Kroeger’s clear-eyed understanding of science, and her knowledge of trees and healing plants. This warm and wise collection of essays ranges from the food we put in our mouths, to the kitchen we cook it in, to the gardens and cities we live in, and how to simplify, restore and make them all healthier. She tells us how to clean our homes and look after pets; how we can protect ourselves and our loved ones from illness; and why we need to appreciate nature. In her inimitable style, she effortlessly combines the latest scientific and medical research—including info on superbugs and phthalates—with practical knowledge, aboriginal wisdom, and her own powerful connection to the earth and trees. Beresford-Kroeger proves that making these changes does not have to be arduous or costly—readers can weave these tips into the fabric of their daily lives very frugally. With a gentle but firm approach, and ample doses of humour, this extraordinary visionary shares her wisdom and advice for achieving better health and peace of mind, with simplicity and pleasure not far behind. Join us on December 7th when award-winning illustrator and author Wallace Edwards will be at the Merrickville Book Emporium for a book signing as part of the Christmas in Merrickville celebrations. Wallace's books are a delight for all ages with their rich, vivid illustrations of animals both real and fantastic that reveal many hidden details upon repeated viewings. 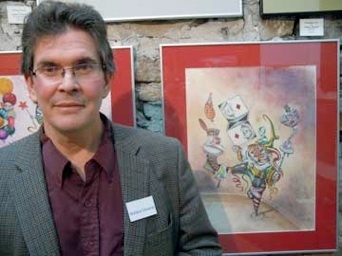 His 2002 work, "Alphabeasts", won the Governor General's award, and several other of his books have been nominated for this prestigious prize. His latest work, "The Cat's Pajamas", is a follow-up to "Monkey Business" in which 26 idioms and familiar sayings are illustrated with Wallace's playful surrealism to produce a gorgeous eye-spy book. Wallace will be at the Merrickville Book Emporium between 10am and 5pm on Saturday, December 7th. The Merrickville Book Emporium is proud to announce a book-signing the afternoon of November 9th. J. William Galbraith, author of John Buchan: Model Governor General, will be in our store on Saturday, November 9th from 1 to 4 pm signing copies of his newly released biography of the celebrated governor general, published by Dundurn. With forewords written by David Johnston, the current Governor General of Canada, and Lady Deborah Stewartby, Galbraith's book also features 30 illustrations and copies will be available in store. An accomplished Scottish journalist, soldier, head of intelligence, and Member of Parliament, John Buchan (1875-1940) is best known for penning thrillers such as The Thirty-Nine Steps. However, as Canada's 15th governor general (1935-40), Buchan, 1st Baron Tweedsmuir, played a significant leadership role as a statesman and diplomat. Buchan was the first governor general appointed after the 1931 Statute of Westminster, which gave Canada constitutional equality with Britain. He worked tirelessly for Canadian unity and promoted the sovereignty, and loyalty to the sovereign, of Canada. In 1937 he founded the Governor General's Awards, still Canada's premier prizes for literary achievement. Lord Tweedsmuir helped draw Canada, Britain, and the United States together to strengthen the democracies threatened by Nazism and Fascism. He was an inspiration to several of his successors and still inspires us today. J. William Galbraith is a council member of the John Buchan Society. His career has spanned the private and public sectors. He lives in Ottawa. Mayor Doug Struthers cuts the opening ribbon. After months of planning and setting up, the Merrickville Book Emporium opened for business on Saturday, August 31st. The Mayor of Merrickville, Doug Struthers was on hand to cut the opening ribbon. Customers browse the shelves on opening day. We were delighted to have so many customers from near and far on our very first day, and we hope to serve the beautiful village of Merrickville for many years to come.